Education plays an essential role in nation building for schools serve as a second home for many students to grow and develop. In these schools, teachers all over the country educate the youth through years of constant guidance and supervision. It is a noble, but at the same time, a challenging profession for it is an important responsibility to undertake day-in and day-out. There have been several enacted laws that have recognized teachers for the value of their services, but unfortunately, it does not include the volunteer teachers that have dedicated their time and energy into undertaking the same responsibility. Volunteer teachers only receive a meager allowance per month for services rendered. This compensation is hardly enough to provide for their family’s needs consideration the rising price of goods thus further increasing the cost of living. In order to increase their income, several volunteer teachers engage in various income generating alternatives such as selling food products, clothes, cosmetics, or other teaching-related services. We believe that if they receive the adequate compensation to alleviate their current condition, the time and effort that was spent on other alternative entrepreneurial endeavors be put to better use that will benefit the schools and the students. In light of this, the proposed measure seeks to regularize volunteer teachers who have rendered at least three (3) years of continuous service in the primary and secondary public school system through the creation Plantilia teaching positions. It is only proper that volunteer teachers be given the appropriate teaching positions (if they are eligible) and adequate compensation that will provide them with a secure source of livelihood. Moreover, it will accord them with the dignity and recognition of their profession as educators. Section 1. Short Title. – This Act shall be known as the “Plantilia Positions for Volunteer Teachers”. SEC. 2. Declaration of Policies. – Under the Constitution, it is among the express policy of the State to give priority, among others, to education, to foster patriotism and nationalism, accelerate social progress, and promote total human liberation and development. SEC. 3. Plantilia Positions for Volunteer Teachers. 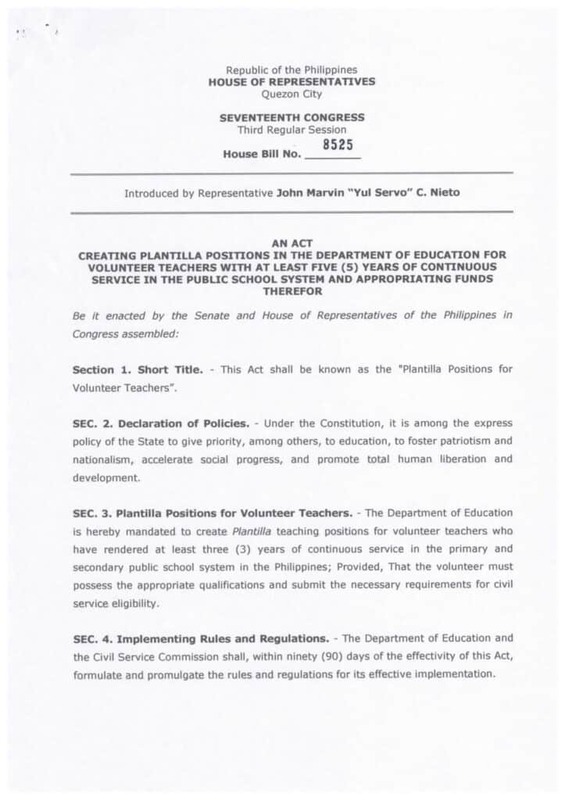 – The Department of Education is hereby mandated to create Plantilla teaching positions for volunteer teachers who have rendered at least three (3) years of continuous service in the primary and secondary public school system in the Philippines; Provided, That the volunteer must possess the appropriate qualifications and submit the necessary requirements for civil service eligibility. SEC. 4. Implementing Rules and Regulations. – The Department of Education and the Civil Service Commission shall, within ninety (90) days of the effectivity of this Act, formulate and promulgate the rules and regulations for its effective implementation. SEC. 5. Appropriations. – The amount necessary for the effective implementation of this Act shall be charged against the appropriations for the Department of Education under the current General Appropriations Act. 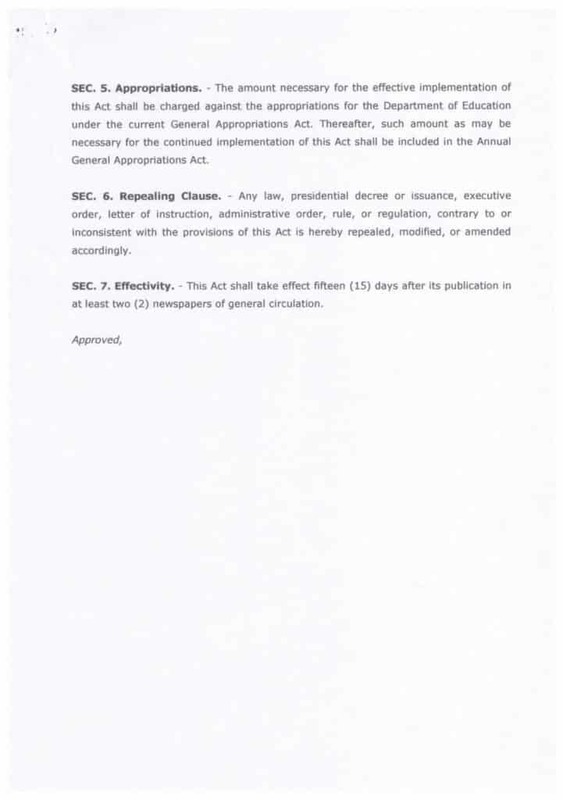 Thereafter, such amount as may be necessary for the continued implementation of this Act shall be included in the Annual General Appropriations Act. SEC. 6. Repealing Clause. – Any law, presidential decree or issuance, executive order, letter of instruction, administrative order, rule, or regulation, contrary to or inconsistent with the provisions of this Act is hereby repealed, modified, or amended accordingly. SEC. 7. Effectivity. – This Act shall take effect fifteen (15) days after its publication in at least two (2) newspapers of general circulation.